The positions are in for AFL Fantasy in 2018. Here’s a snapshot of the names that are the most relevant according to the questions I’ve been asked on social media and who I think people would want to know about including all draftees. Feel free to ask for more in the comments. Click here for the AFL.com.au article. Pick-by-pick in the 2017 draft. So many on the watchlist already. Cant wait for next year! Rookies should be plenty to, especially from West Coast. When DT live is open to select the team? If you know it. We’ll have some stuff on pricing next week. Deck of DT will start January 1. As for DT Live, I think Chad is working on it now! Any word yet on AFL Fantasy having a keepers league starting from next season yet Warnie in draft? No official word as yet. Iam not addicted at all. FWD line is pretty weak, but value. Yea my bad, Francis would be on the bench. I think Mills will be good this year, over the second year blues. Take McVeighs old role. Yea cool, should still work out the same with the prices. Nic Newman – how is he a mid only ? Can you post his 2017 heat map please Warnie ? Looks like Warnie has given up on answering these requests. Supercoach as well …. nothing from AFL Fantasy yet … not surprised though they wouldn’t want us to enjoy ourselves. As a paying Fantasy Coach member I will be sadly disappointed if some sort of Team Picker is not open before Xmas for those who paid for the subscription model. I Would not pay $19.95 again if I had to wait until it opens for everyone! 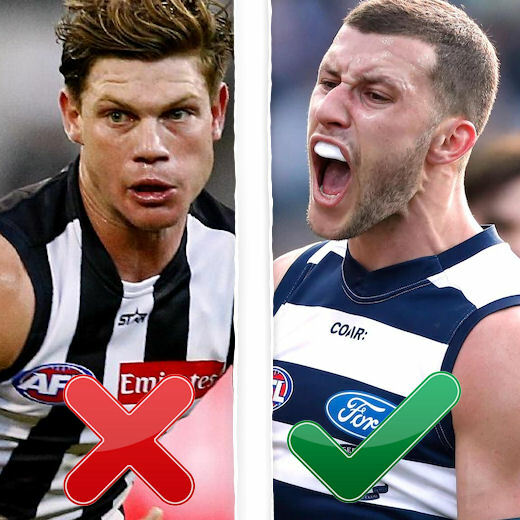 FYI – There is no team picker for AFL Fantasy. There hasn’t been for 5 years and no part of the subscription says we get one! Won’t fall for that again. I used the Fantasy Coach subscription for much more than that, but if that’s all you used it for, then maybe you’re better to save your dollars. 99th going into the last sunday? So you didnt get 99th did you? But you name dropped 99th going off live ranking..
My team was trash you say James? Yet I outscored you by 64 points in round 23 well played sir! Maybe you should sign up to my Fantasy preseason camp it’s only $19.95! 1. With Gibbs gone will we see Cripps improve more than 10ppg? 2. Will Hodge help or Hinder Witherden awesome Fantasy Game? Shut up about Witherden, yeah? As a Lions supporter I think he could be fantastic in 2018, with a full Pre-Season and Luke Hodge as a mentor. It would take cahones the size of space hoppers to start with him, but he could be a great POD.